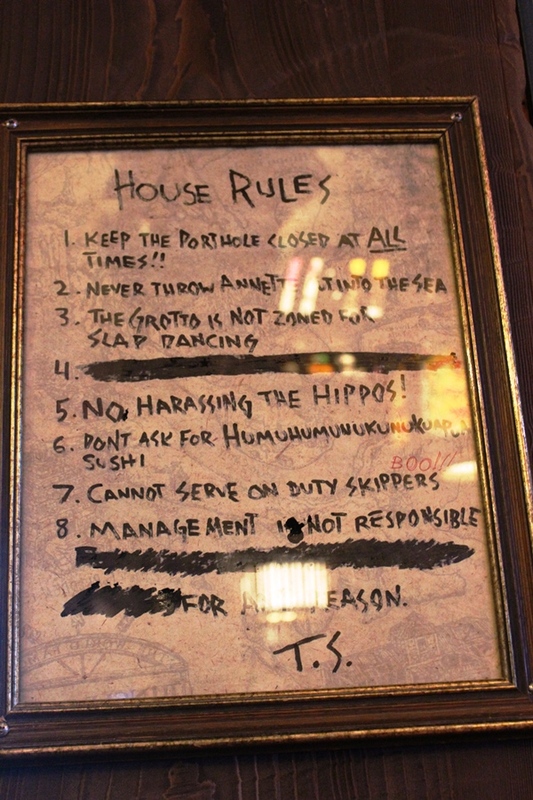 No matter if you’re on the west coast or east coast, when you venture inside Trader Sam’s there are rules you have to follow! While some employ clever wordplay or tie in to specific attractions or Disney history, we’re more concerned with making sure we live by the rules. With that in mind, let’s look at both sets of guidelines and see what you can and can’t do when you’re at Disneyland or Walt Disney World. 1. Blow dart guns are not to be used as drinking straws. 2. Cannibals not serve people! 4. Do not provide alcohol to on duty Jungle Cruise skippers. No exceptions!!! 5. Call bartender if Schweitzer Falls. 6. No poison dart games. 7. Management is not responsible (REDACTED) under any circumstances! 1. Keep the porthole closed at ALL times!! 2. Never throw Annette into the sea. 3. The grotto is not zoned for slap dancing. 5. NO HARASSING THE HIPPOS! 6. Don’t ask for Humuhumunukunukuapua sushi. 7. Cannot serve on duty skippers. 8. Management is not responsible (REDACTED) for any reason. So as to not confuse anyone, remember these helpful hints! Fellow thirsty travelers out in Disneyland can open the portholes, harass the hippos, and throw Annette into the sea until your heart’s content. And Walt Disney World imbibers, feel free to partake in blow dart straws, poison dart games, and have cannibals serve people until the hippos come home. But don’t forget, no matter where you are, management is not responsible!